What are your study habits? Do you like to study in the library or in the room? If you study in the room, does it have to be completely silent? Do you pull up-all-nighters frequently? Do you not study at all and instead plan to party your way through college? Are you okay with visitors? Can my high school friends occasionally visit? What about my significant other? What are your sleeping habits? Do you stay up until 4 am with your laptop’s screen at full brightness, plastic loud music, or laughing loudly at funny memes? If you go to bed at 10 pm every night, this could be a problem. Are you okay with sharing? This can go from sharing clothing to textbooks and kitchen appliances. You should know that no matter the answer, you should always ask before you borrow anything. How often do you clean? Is it important to you is to wash the dishes as soon as you finished using them, or are you used to letting them accumulate in the sink? This and other cleanliness questions are vital because if your expectations don’t match you will probably have arguments frequently. Realize how the answers to these questions might affect your own college experience. Are you looking for your next best friend? This could be the person you do everything with from going to parties, to studying, to laundry and cooking. Or are you more interested in someone you can get along with, but won’t need to see at all times, just occasionally when you both go to sleep and therefore you have your own space? Do you want to live with someone who has your same interests and hobbies? This could be fun, if you are both into the same movies and TV series, you could make a habit of watching them together, or you could have a new gym partner. If on the contrary, you want someone who is your opposite, this could allow you to learn new things and be exposed to new experiences, which is always interesting. Do you want a roommate whose schedule aligns with yours? This could be nice because it would allow you both to work together and hang out when you have free time, however, if your schedules align perfectly, you won’t have much privacy or alone time in the dorm. If what you want is someone on a different schedule, you will have more time to have the room all to yourself, however, if they are too different it could be inconvenient as you might wake each other up unnecessarily if the sleep schedules are too different. Don’t think you know them because you know their Social Media. If revising your potential roommate’s Facebook, Twitter, Instagram, Snapchat, Tumblr, LinkdIn, Pinterest and Blog (or basically, as many of their social media as you can find) is part of your strategy, good. This can be helpful in gaining a sense of who they are. However, remember that social media can be highly curated and it doesn’t exactly show who we are. Spend some time talking and texting with your potential roommate to make sure you could be a good match for each other. Make sure that your personalities are a good match. You don’t have to be exactly the same, but it really is a good idea that you have similar temperaments or personalities. If you are quite introverted, like to stay home watching Netflix or studying, and prefer a trip to the movies than a crazy night partying, maybe you will have a better time with someone that has similar preferences. If instead, you do love partying and going out and are looking for a partner in crime, then maybe make sure that you actually find them. 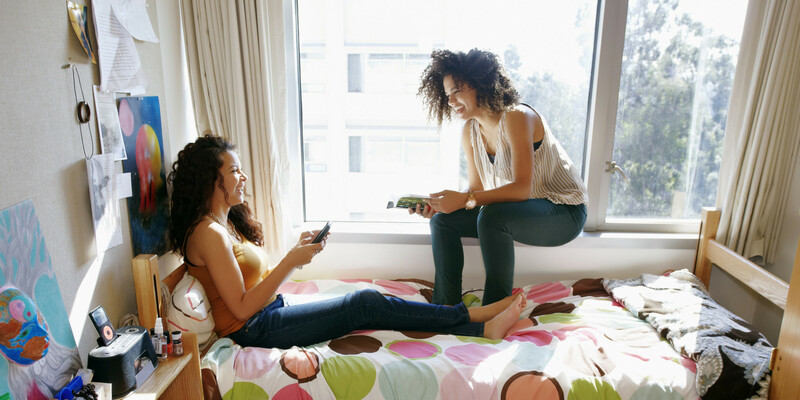 Do you have other tips about how to choose a college roommate? What is your favorite thing to pack when you leave home? Let us know by tagging us on our Instagram @glamandgowns, and Faviana’s Instagram @Faviana_NY and Twitter @FavianaNY. Also, add us on Snapchat @faviana_ny to learn all about the Faviana lifestyle.